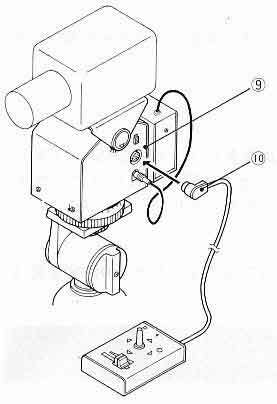 Motorized Pan Tilt Heads, Manual for the PT400t Motorized Pan/Tilt head. 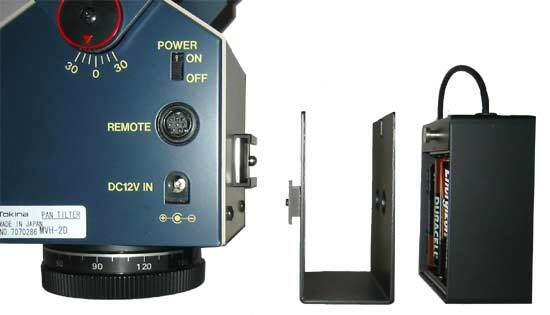 Home Page > Motorized Pan Tilt Heads and Systems > Manual for the PT400t Motorized Pan/Tilt head. 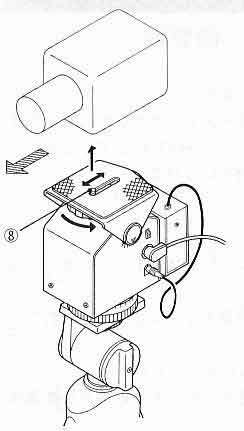 Manual for the PT400t Motorized Pan/Tilt head. Indoor Pan & Tilt head. Allows you to move the camera up & down, right & left over a wired hand held remote control. Indoor motorized pan & tilt system, with motor and wired joystick remote control. Accommodates a 10 pound load (center of gravity at 1.5"above plate). 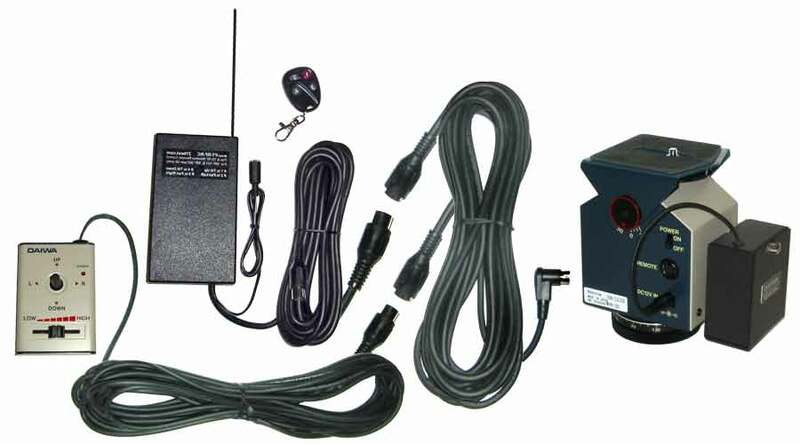 Wired Remote Control with 22 feet of cable. Side view of PT400t motor,battery bracket and battery case. You can Pan (vertical) and Tilt (horizontal) at the same time, you can also make diagonal movements. Pan 300 degrees total (horizontal movement). Tilts 60 degrees total (vertical movement). Adjustable speeds. No soldering or splicing. Maximum Load 10 (camera weight). Bottom view of PT400t motor with a 1/4-20 thread for connection to your tripod. Pan movement: ------------------ -150 degrees to +150 degrees in horizontal plane (300 degrees total). Tilt movement: ------------------- -30 degrees to +30 degrees in vertical plane (60 degrees total). Maximum Load: ------------------10 pounds in upright position. (center of gravity at 1.5"above plate). Maximum Cable length: --------- 22 feet (or up to 600 feet by extending the control cable). Dimensions: ----------------------- 3.5" x 6" x 4"
Tilts 60 degrees in 33 to 96 seconds. Tilt has 3 foot-pounds of torque. Pans at 1 to 3.7 minutes per revolution. 15 to 55 seconds per 1/4 revolution (90 degrees). 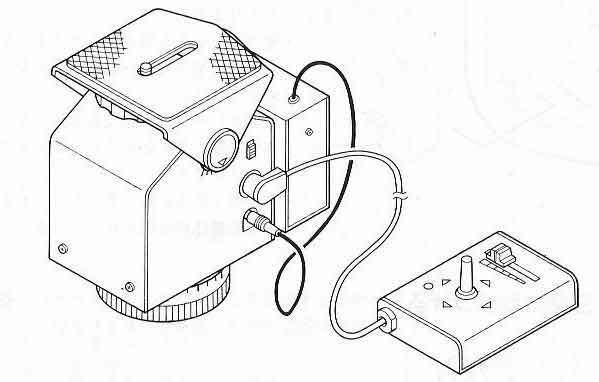 Motor is activated by contact closures. for the PT400t Medium Duty Indoor Pan and Tilt system. Extend the wired joystick remote control with a custom breakout option. This option adds 20 feet and two new connectors to the joystick cable. Extendable from 20 feet to 600 feet or more. 20-foot and 50-foot extension cables priced separately. 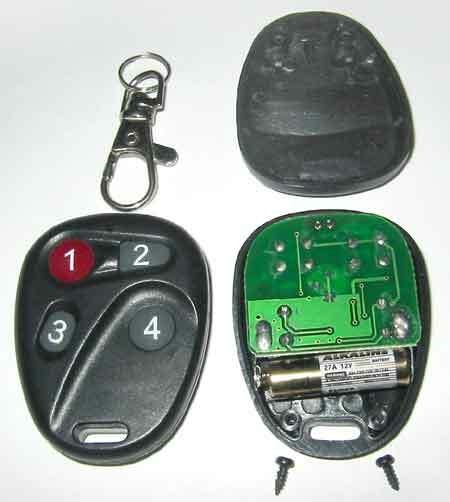 Model PT400t-EXT Remote Control Extension Breakout Option. The Breakout Option is required for any Remote Control Extension cable to function. 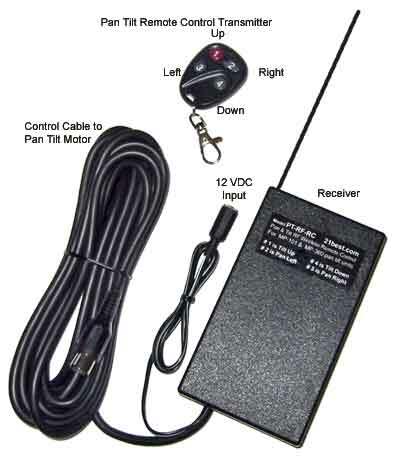 Model PT400t-20 Remote Control Extension 20-foot Cable. 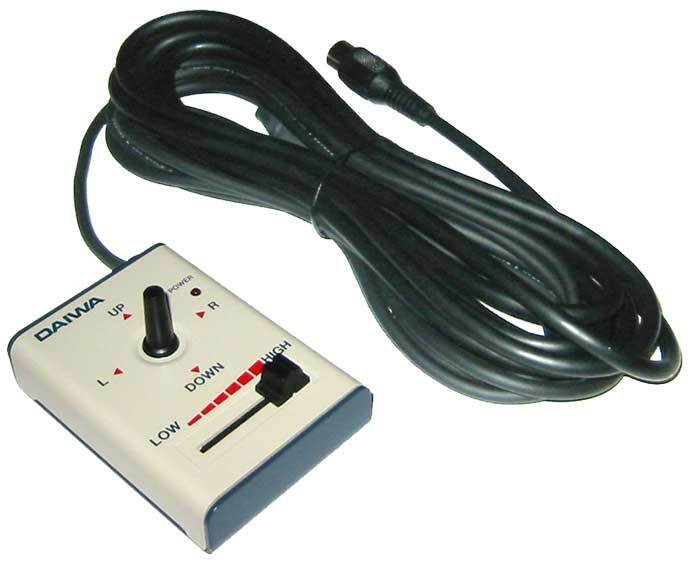 Model PT400t-50 Remote Control Extension 50-foot Cable. Operate your Pan Tilt unit from across the room or across the street. Save time, no long wires to install. Safer, less wires to trip people. 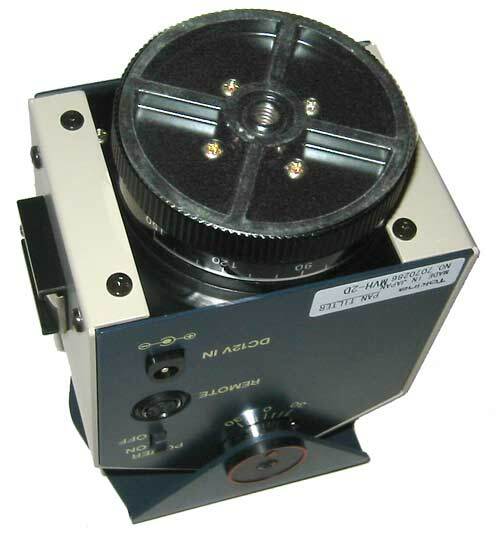 Works with the PT400t pan tilt unit. The Breakout Option is required for this to function(see above). you can make diagonal movements. compartment on the backside of the receiver. Slide the small cover off and turn the knob to adjust the speed. 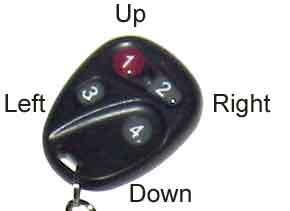 Button #1 is Tilt Up and #4 is Tilt Down. Button #3 is Pan Left and #2 is Pan Right. to control 16 different pan tilt units in the same room at the same time. receiver to control one pan tilt unit. Keep the antenna in the clear & elevated. Transmission Range --------------------Up to 200 feet. 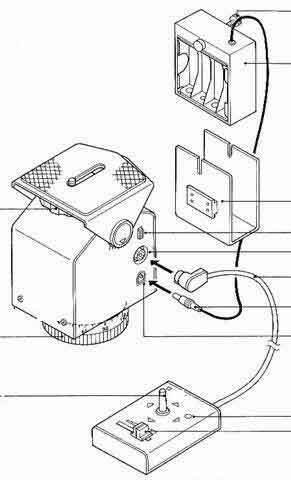 Transmitter Power Source ----------# 27A Battery, 12 Volts DC. Transmitter Dimensions: --------------2" High x 1.5 " Wide x 0.5" Deep. Receiver power cable ----------------- 3 feet long. Receiver control cable -----------------20 feet long standard, or 1 to 50 feet long with custom order. Receiver control cable -----------------Extendable to 600 feet with optional cables. 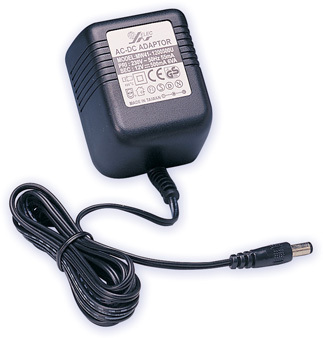 Receiver Power Adapter ------------120 VAC input and 12 VDC 500 mA output, included. Receiver Battery Holder -------------8 AAA batteries that lasts 5 to 15 hours, included. Receiver Dimensions: -----------------5.5" High x 3.25" Wide x 1.5" Deep. Ready to use pan tilt system. 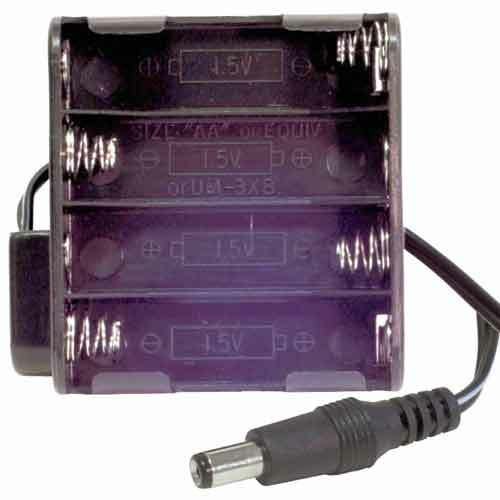 # 27A Battery, 12 Volts DC. Remove the chrome Swivel Hook. Tilt and slide the back cover off. Replace with a fresh 27A battery. 1. Be sure your PT400t has power connected to it. 2. Connect the control cable. 3. 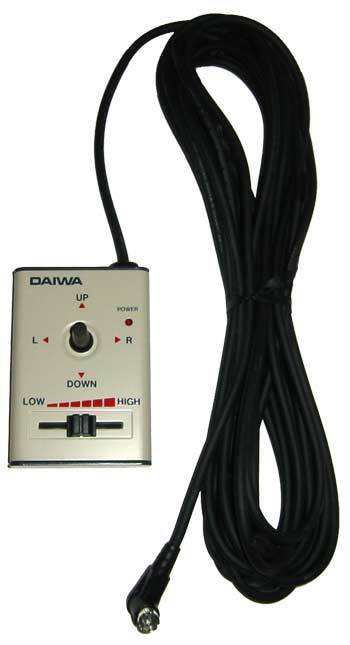 Connect the AC / DC power supply to the 12 VDC power jack. There is no power switch, the unit is "on" as soon as power is connected. #1 is Tilt Up and #4 is Tilt Down. #3 is Pan Left and #2 is Pan Right. Not for use around dangerous environments such as High voltage, Explosive atmospheres or Moving equipment etc. Please Think before you use it. hand held, pan tilt, remote control. 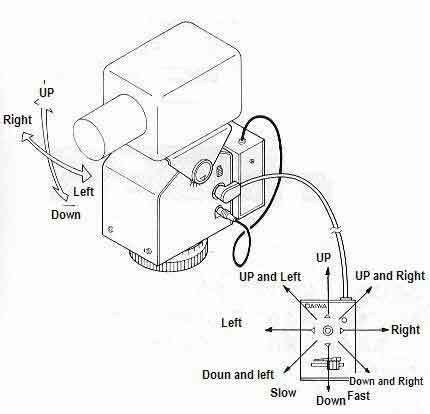 Manual for the PT400t Motorized Pan/Tilt motor. Pan movement: ------------------150 degrees to +150 degrees in horizontal plane (300 degrees total). Tilt movement: --------------------30 degrees to +30 degrees in vertical plane (60 degrees total). Pan speed: ------------------------2.0 degrees per second to 6.5 degrees per second. (Variable). Tilt speed: ------------------------- 0.7 degrees per second to 2.2 degrees per second (Variable). Maximum Load: -----------------10 pounds in upright position. (center of gravity at 1.5"above plate). Maximum Load: ----------------- 6 pounds in inverted position. Maximum Cable length: ------- 22 feet (or up to 600 feet by extending the control cable). Mounting: ---------------------------Horizontal and upright or inverted position. Operating temperature: --------15 F to 115 F.
Dimensions: -----------------------3.5" x 6" x 4". Power Source --------------------DC 12 Volts 270 mA max. (8 X AA size penlight batteries). Total amount of tilt is 56 degrees. Tilt speed 1.8 to 0.6 degrees per second. Tilts 22 degrees in 12 to 35 seconds. Pans one RPM in fast speed. Pans 6 to 1.6 degrees per second. 15 to 55 seconds per 1/4 revolution. 1. Pan-Tilt Head is set on the tripod and use for Video camera with wired remote control. 2. Pan (vertical) and Tilt (horizontal) is possible to control and also possible pan and Tilt same time. Possible to adjust speed variable. 1. Must be fastened to mounting surface. 3. Body must be level. When not level function is not maximized. 4. Put in plastic bag when boxed in foam polystyrene. 5. Don't drop and give shock. 7. After use Power switch (13) off. 1. Normal AA battery good for 2 hours to operate. 2. 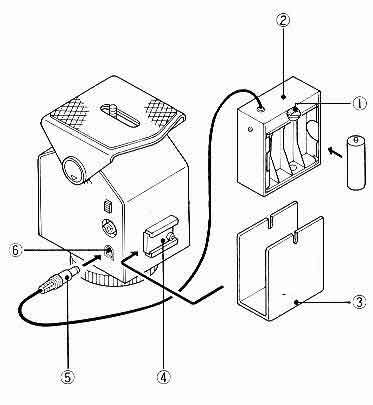 After use turn off power switch (13) or remove to remote controller. Power drain will occur if unit is not switched off. 1. Battery Plus and Minus must be carefully install. 2. Do not mix old and new battery. 3. Do not mix different type of battery. Screw size for this equipment use for 1/4 - 20 UNC. When installing to be careful check area to include camera space. When using upside-down maximum load is 3 kg. Type: AA Battery 8 pieces (Option). Loosen Battery cover fix screw (1) Battery box (2) take out. Battery is each side 4 pieces. Put Battery box cover (3) to Battery box (2) and install Battery cover screw (1). Battery box cover (3) slide to Battery box holder (4). This unit must be installed on tripod or another stable base. Tripod screw fixes on Stand (7). Before installing tripod must keep tripod head level. Camera direction is same as diagram. Balance of camera and lens must be center and tight screw. Screw position is possible to slide. This unit can hold Max. 5 kg camera (balance height 6 cm). Not in balance will diminish functions. Remote controller cable (10) put on Unit (9) same as diagram direction. Speed control lever (11) slid to left be low Right is High speed. Not possible to adjust Pan and Tilt separately. Tilt speed will be change depending on weight of camera or direction. Control lever function is same as diagram direction. Possible to move Pan and Tilt same time. After use make sure the power is switched off. Pan (Horizontal) by remote control is from [ 0 ] point left or right about 150 degrees each. 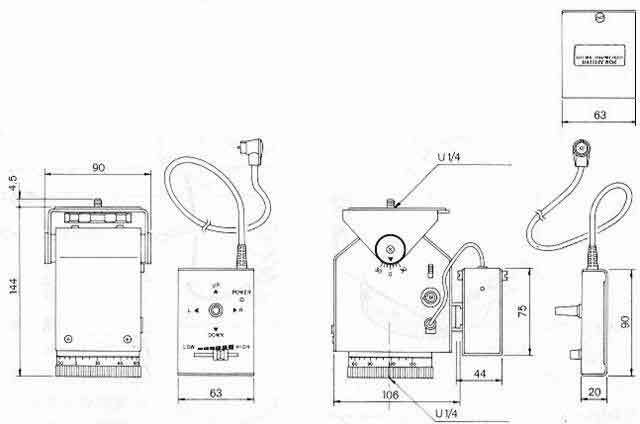 This unit have slip system Fix stand (7) and body. Anytime possible to turn by hand. Tilt (vertical) have NO slip system. Don't push. When use slip function be careful to handle for cabling. CAUTION:To reduce the risk of electrical shock. Do not open covers. The lighting flash with a arrowhead symbol, in an equilateral triangle, is intended to alert the user. There is uninsulated"dangerous voltage" presence near the product's enclosure which may be a risk to people. The exclamation point within an equilateral triangle is to alert the user to reference of the important operating and maintenance (servicing) instructions. Pan Tilt Zoom (PTZ) CCTV cameras are affordable and offer better performance then ever. Pan Tilt Zoom surveillance cameras are used by Government, large corporations, casinos and consumers. Other uses include Mast Aerial Photography. PTZ cameras rotate horizontally through 360 degrees, vertically through 90 degrees and have motorized optical zoom lenses. 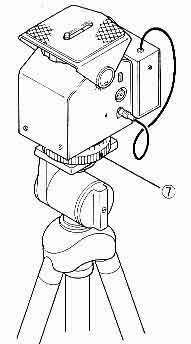 A camera turret or motorized swivel is similar to a pan-tilt head. 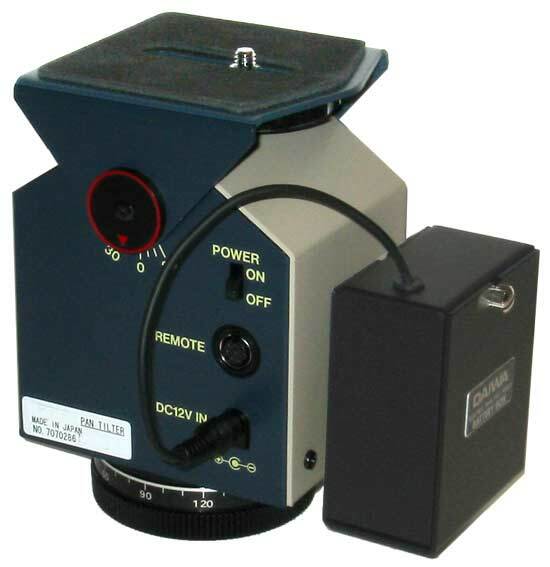 Pan Tilt movement can be very fast and is controlled through a wired (or wireless) connection, by the mating controller. PTZ cameras are often mounted in domes, outside dome cameras are weatherproofed, heated and cooled.